We also asked for the safety and minor improvements budget to be increased as local boards are most likely to look to this fund to achieve transport priorities. Getting Auckland Moving – Alternative Funding for Transport Discussion Document- I worked on the Board’s feedback on the Discussion Document which is attached to the agenda. The feedback notes that the extent of the funding gap has been created due to the government’s failure to contribute Auckland’s share of the GPS for Land Transport Funding to transport projects that will significantly advantage Auckland such as the CRL. Auckland Transport – draft Statement of Intent – The Board provided comments on the draft Statement of Intents for all of the Council Controlled Organisations (attached to the Agenda). I particularly focused on the Auckland Transport SOI which in its current form provides insufficient direction to AT and must be strengthened in order to give effect to the vision and priorities of the Auckland Plan and the transport priorities of the region’s 21 local boards. Parnell roundabout -Parnell Inc has raised objections to the proposed Parnell roundabout at the intersection of Parnell Road and Parnell Rise as they consider the roundabout will increase congestion on Parnell Road. A meeting was held with AT and members of Parnell Inc on 18 April (member Dempsey attended for the Board) Next steps: AT is in the process of responding to a LGOIMA request from Parnell Inc relating to the proposal. Wellington Street off- ramp – The newly formed Herne Bay Residents Association has raised concerns about the increase of traffic on Curran Street due to the closure of the Wellington Street on ramp. I attended a meeting for residents at NZTA with representatives of Auckland Transport. NZTA are studying the impact of the closure on the surrounding area and have undertaken to consult with stakeholders on any proposal going forward. Next steps: Awaiting a response from NZTA to the results of their study. The need for the speed limit enforcement on Curran Street to be raised directly with the Police by AT. K’rd over bridge – I met with Barbara Holloway on 20 April to discuss the incorrect installation of the metal panels on the K’rd over bridge which was completed in August 2011. The original design was intended to provide pedestrians with a view to the North Shore from the bridge. Unfortunately Opus has installed the panels so that the view is obscured for most of the length of the bridge and from the seating area that was specifically installed for the view. Next Steps: Stephen Rainbow has been requested to confirm how AT intends to resolve this issue. LTP Hearings – The draft Long Term Plan 2012-2022 hearings were heard by the Board on 19 April with a number of thoughtful presentations. It is of concern that submitters were given a very short notice period about the hearings date which reduced the number of submitters who were able to attend. Deliberations on the submissions were held at our Local Board Workshop on 24 April. Campbell Free Kindergarten – Planning has been underway during April for the open day at the newly restored Campbell Free Kindergarten in Victoria Park to be held on Saturday 5 May. Feedback is being sought from the community about possible uses for this historic building. Community Assistance Policies -During April Auckland Council consulted on three new region-wide policies relating to how Auckland Council provides community assistance; the draft Community Occupancy Policy, draft Facility Partnership Policy and draft Community Funding Policy (consultation is open until 18 May on this policy). A notice went out to the Board’s community database from me and member Reade as the Community Portfolio. I attended one of the GLBA’s fortnightly meetings in April. 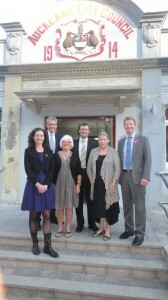 The Committee met to consider applications for the third and final round of the community grants funding 2011/12. A total of $25,345 was recommended in grants to the Waitemata Local Board ordinary meeting on 10 April 2012. The minutes of the meeting are attached to the agenda. Community Group Assistance Fund (Round 2) – The total funding pool available for 2011/2012 was $450,000. Of this, $435,000 was available for the isthmus area to be distributed over two funding rounds in the 2011/2012 financial year. The first round of CGAF opened on 25 June 2011, closed on 29 July 2011, and funded 22 groups totalling $205,741. The second round of CGAF opened on 2 December 2011 and closed on 20 January 2012. Council received 106 applications from 97 groups requesting a total of $1,364,696.83. Officers assessed all applications and presented their recommendations to the Committee at a workshop meeting held on 16 March 2012. The joint funding committee approved the allocation of the second and final round of funding of $229,259 at its meeting on 26 April. Auckland City Cultural Heritage Fund Allocation – The Isthmus Local Board Joint Funding Committee meeting considered 10 applications for funding from $21,250 available for allocation for the remainder of the 2011/2012 financial year from Cultural Heritage Fund. Of the 7 applications recommended by officers for approval 4 were within the Waitemata Local Board area. I attended the Australasian Permaculture Convergence in Turangi from 11-15 April. A report on this conference will be attached to my June Board report. I enjoyed Easter on Waiheke where I was impressed with the new bike racks on buses and commend Fullers and the Waiheke Local Board for supporting this initiative.